A recent list of the top ten grimoires — books of magic— included a book called the Necronomicon.Not too bad for a work that started as a literary in-joke. How did the Necronomicon make the leap from fiction to occult notoriety? Let’s look at the story. One century ago, a young man named Howard Phillips Lovecraft was living in Providence, Rhode Island. Having left high school due to illness before graduating, he was unable to fulfill his dream of going to Brown University. His once-wealthy family was slipping into genteel poverty, but he was nonetheless expected to uphold the lifestyle of a gentleman of leisure. Lovecraft must have found negotiating these expectations and hopes a difficult situation. He found an answer in writing. At first he wrote essays on political and cultural topics, but soon he found his true strength: short stories of monsters and tortured souls, written in the style of Edgar Allan Poe. In 1923, he submitted these works to the pulp magazine Weird Tales, where he found himself gaining some success— and a little money on the side. As Lovecraft continued to write, he sought his own voice, creating a series of fictional props to express his philosophy and aesthetics. The most notable of these creations, the dread Necronomicon, appeared for the first time in his story “The Hound,” written in 1922. This tale centers around two grave robbers who take a magical talisman from a corpse, causing them to be pursued by a horrible undead monster. In their desperation, they consult the Necronomicon for more information on the topic— but it does not tell them how to stop the beast. In “The Hound,” Lovecraft mentions “Abdul Alhazred” as the book’s author. Alhazred was actually a childhood name of Lovecraft’s during a period when he was fascinated with The Arabian Nights. In a previous story, Lovecraft had even composed a piece of poetry by Alhazred: That is not dead which can eternal lie, And with strange aeons even death may die. This poem was to become the leitmotif of Lovecraft’s fiction. Humanity, according to Lovecraft’s cosmology, is but a transitory phenomenon on this planet. Beyond the realm of everyday consciousness are older forces— magic, monsters, lost civilizations, and other mysteries of the universe. The protagonists in his tales are usually men driven to explore the past due to curiosity or compulsion. The horrific— or awe-inspiring— revelations they uncover leave the narrators shaken, missing, or insane. Throughout these works, the Necronomicon continued to appear. At different times, it was a collection of lore regarding the dead, a book of spells, or a history of the pre-human aliens who inhabited our planet. As Lovecraft continued to write and submit his stories for publication, these references to the Necronomicon showed up more often inWeird Tales. Lovecraft’s creations were destined for greater things, however. As he wrote, Lovecraft developed a circle of friends with whom he often exchanged stories before publication. In addition, he sometimes revised the stories of others for publication, usually at a minimal fee, which were then published under his clients’ names. These behind-the-scenes relationships became mirrored in his stories, with monsters and books— including the Necronomicon— mentioned by one author appearing in stories by another. One incident will illustrate how this process worked. Lovecraft’s young protégé Frank Belknap Long composed a quote from the Necronomicon for his short story, “The Space-Eaters.” Long claimed that his particular quote came from the English translation made by the real-life Elizabethan wizard John Dee, a famous figure in occult history. Lovecraft himself inserted John Dee’s translation of the Necronomicon into his story “The Dunwich Horror.” When publishing Long’s story, an editor cut the original quote from John Dee. Thus, Dee’s translation of the Necronomicon appeared through Lovecraft, even though Long actually created it. If this is hard for us to follow, imagine the reaction of the pulp magazine readers. 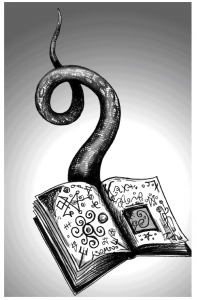 If the Necronomicon appeared in tales by multiple authors, could the book be real? Both Weird Tales and Lovecraft himself received letters asking if the book really existed. Both told the inquirers that it was Lovecraft’s invention, but the letters continued. Lovecraft passed away in 1937 from a combination of cancer of the intestine and Bright’s disease. He had never received top billing in Weird Tales, but soon he was recognized as a giant in his field. His fiction was republished and read throughout the burgeoning fandom in what would soon be known as science fiction. As Lovecraft’s fame grew, so did that of the Necronomicon. Fans of Lovecraft wrote stories in their small-press magazines that featured the infamous book. As time went on, the first Necronomicon hoaxes appeared. Booksellers published tongue-in-cheek ads seeking or selling the book, and entries for the book appeared in the card catalogs of many libraries. This low-grade hoaxing only spread the fame of the book further. The Necronomicon Explosion The Sixties counterculture encouraged people to seek out new realities beyond the commonplace and everyday, whether through escapist fiction or new philosophies. As a result, Lovecraft’s stories were converted into movies for the first time, with films such as The Haunted Palace( 1963) and The Dunwich Horror( 1970) bringing distorted retellings of his vision to broader audiences. Lovecraft’s stories, along with classic fantasy and science fiction works, were re-discovered and reprinted for these new audiences. In addition, past writings by occult explorers such as Israel Regardie, Gerald Gardner, and Aleister Crowley found popularity once again. All of this led to an atmosphere ripe for the resurgence of Lovecraft— and the Necronomicon. The first major Necronomiconhoax to appear was the Al Azif, published by the science fiction publisher Owlswick Press in 1973. Its owner, George Scithers, commissioned artist Robert Dills to draw page upon page of Arabic-like calligraphy. Author L. Sprague de Camp then wrote up a description of how he had bought the book on a trip to Iraq, after three scholars of ancient languages had disappeared while attempting to decipher it. The book had a limited run of 348 copies, but it soon became a collector’s item purchased or given to many libraries. Occasionally someone runs across this book in a special collections department and gets a thrill out of it. The Owlswick book’s text was indecipherable, but its circulation through the fan community nonetheless inspired two other Necronomicon hoaxes that are still with us today. One of these Necronomicons was assembled at the behest of the British publisher Neville Spearman. Robert Turner, head of the Order of the Cubic Stone, used his deep knowledge of ceremonial magic to assemble a grimoire with ornate magical tools and intensive, complicated rituals requiring long preparations and mystical substances. David Langford claimed that this grimoire had emerged from a computer analysis of Liber Loagaeth, a set of mystical tables of letters created by John Dee, who we’ve seen mentioned before. If the reader was to believe this, however, it was necessary to find out how Lovecraft could have uncovered the mysterious book without contact with Dee’s manuscripts or a convenient computer decipherment. Occult author Colin Wilson spun a story about Lovecraft’s father being a Freemason who owned the Necronomiconas part of his lodge activities. Though Lovecraft’s maternal grandfather was the head of a Masonic lodge, no evidence that he or anyone else possessed the Necronomicon has ever emerged. Wilson also spoke of L. Sprague de Camp’s Al Azifas if it were an actual book. Nonetheless, all of this made for an entertaining new Necronomicon. Wilson and his compatriots even published a sequel to this book— the R’lyeh Text, named after another book of forbidden lore created by Lovecraft correspondent August Derleth. The other work has been so influential— and not always in a positive manner— that it deserves its own section. The Simon Necronomicon Across the Atlantic, another Necronomicon was being written. We know relatively little about its ultimate genesis, save for rumors that it emerged from a particularly wild party held at or near the Warlock Shop, a magical supply company in Brooklyn. Nonetheless, it might be possible to reconstruct a large part of the story. Central to this scheme was Simon, a supposed priest of an Eastern Orthodox denomination. Speculation has been rife as to the man’s real identity. The most likely candidate, identified as such by both author Alan Cabal and the U. S. Copyright Office, is noted conspiracy author Peter Levenda, best known for his book Unholy Alliance on Nazi occultism. In 1973, two monks of a questionable Eastern Orthodox denomination were caught attempting to steal numerous books from libraries and private collections across the country. According to Simon, these men found a ninth-century Greek manuscript which made its way to him. He commissioned three translators to decipher the book and then returned it to his sources— just in time for the evidence of these crimes to be conveniently destroyed. The only person’s word we have for any of this is that of Simon himself. Simon’s first articles, appearing in the pages of Earth Religion News, the Warlock Shop’s newsletter, reveal a likely motivation for the hoax. At the time, the Warlock Shop had two major groups of customers. On one hand were the Pagans, who possessed an earth-based spirituality and performed simple rituals drawing on the moon and the goddess. On the other were the ceremonial magicians, who practiced magic from ancient manuscripts that was formalized and Judeo-Christian in content. Simon wrote a series of articles attempting to bring together both Paganism and ceremonial magic in a new synthesis, based on the beliefs and practices of the ancient Sumerian civilization. Another likely source for the book was the Owlswick Press hoax. An ad in Earth Religion News from 1973— the same year as the Owlswick edition’s release— lists aNecronomiconin the “original script” for $ 25 at the Warlock Shop. At the same time, it promises a “forthcoming” English translation selling for $ 10. One individual I talked to mentioned seeing the Al Azif prominently displayed in the store. Oddly— or perhaps not— Simon has never mentioned this book or its presence at the Warlock Shop. The Simon Necronomicon presents a dualistic cosmology in which the “Elder Gods,” or the deities of the ancient Sumerian civilization, must be approached to save us from the “Ancient Gods,” similar to the alien monsters from Lovecraft’s fiction. To contact the Elder Gods and gain their power, the magician must walk through seven “gates” corresponding with each of the classic planets (Mercury through Saturn, plus the Moon and Sun) and particular colors and metals. In doing so, they become capable of using various spells, calling up the dead, and invoking the “Fifty Names” of the Babylonian god Marduk, so that they might protect the world when the Ancient Ones returned.To sell this book, Simon marketed it to a wide variety of belief systems. His introduction is a tour de force of marketing. Not content with simply covering ceremonial magicians and pagans, he also included sections appealing to Satanists, science fiction readers, and fans of The Exorcist. This rampant commercialism did take a turn toward white supremacist ideology. Many of the etymologies from the Necronomicon are taken from L. A. Waddell’s dubious Sumer-Aryan Dictionary( 1927), a work claiming that all ancient civilizations, including that of the Sumerians, were founded by fair-haired men. This might have been an effort to sell the book to the followers of National Renaissance Party founder James Madole. Madole was known for his fascist leanings, his love of science fiction and the occult, and— according to one source— a deep familiarity with the works of Lovecraft and other associated authors. He spent much time at the Warlock Shop and advised Levenda, who was working on a book on neo-Nazism. The month after Madole’s passing, Levenda traveled to Colonia Dignidad, a supposed Nazi colony in Chile. The experience left him shaken, and he left the New York City occult scene shortly thereafter— but not before Avon Books had offered a contract for the publication of the Necronomicon in paperback. Paradoxically, the Necronomicon became both highly influential and largely disregarded in the years to come. Its sales in chain bookstores across the country made it one of the top-selling books on magic of its time, and many teenage practitioners learned about occultism for the first time in its pages. At the same time, most practitioners with a few years of experience found the book’s combination of disparate doctrines with fiction to be distasteful or humorous. As such, the Necronomicon has had little impact on Western magic outside of those who practice the system on their own. The Simon Necronomicon inspired a number of books on how to work its system more effectively. The first of these, the Report on the Necronomicon or Necronomicon Spell book by Simon, appeared in 1981. This work provided simple instructions for dealing with the “names of Marduk.” A few other unauthorized books on working with the Necronomicon appeared over the years. In 2006, Simon issued the long-awaited Gates of the Necronomicon, which described in great detail the procedure for walking the Gates. Simon also made another contribution to the Necronomicon controversy in 2006, which he issued a book called Dead Names refining his previous story of how the Necronomicon came into being. His justifications of the book’s authenticity are clumsy, largely built upon selective quotes from reference books, random and unverified Internet articles, and invective at “so-called” occultists— a label that seems to be based on whether someone disagrees with him. Simon has appeared repeatedly since then, giving at least three contradictory stories as to why he must remain anonymous and thereby turning his dramatic tale into an ongoing farce. It is telling that no associate from the Warlock Shop has emerged to validate his account. A more recent addition to the ranks of the Necronomicons was the edition written by Donald Tyson and published by Llewellyn. Ironically, this book began with The Necronomicon Files, a book I co-wrote with John Wisdom Gonce on what we called the “Necronomicon phenomenon.” We asked Tyson to write a foreword to the book, and, to our deep appreciation, he did so. Afterward, Tyson contacted me with a new project. Our book had inspired him to delve further into Lovecraft and the Necronomicon myth. He wanted to create a new Necronomicon, a work of fiction completely faithful to Lovecraft’s vision of the book. I thought it was a great plan, and I happily made some comments on his draft as he continued. In the end, Tyson’s Necronomicon: The Wanderings of Alhazred( 2004) went into the publisher’s marketing division as fiction and emerged as non-fiction, thus adding me to the ranks of Necronomicon hoaxers! I should add that I bear Tyson no animosity over this, as he has always dealt fairly with me. Since then, Tyson’s Necronomicon has become an occult publishing phenomenon, giving inspiration to a novel (Alhazred), a Tarot deck, and a workbook (Grimoire of the Necronomicon). Until recently, however, most accepted the book itself as a recent creation. Nonetheless, recently an aura of mystery has begun to build around the book. The latest rumor is that I am working with Donald Tyson in a Lovecraftian magical order bent on discrediting the Simon Necronomicon to gain power for ourselves! The Evolving Necronomicon In recent years, the legend of the Necronomicon has grown. Its appearances in media have become more prevalent, as the book turns up in novels, comic books, movies, television shows, and games. One notable appearance has been the Evil Dead franchise, in which the smart-mouthed department store clerk, Ash, battles zombies and demons he accidentally freed from incantations in the black book. In fact, mentions of the Necronomicon have been so prevalent in the horror genre that director Guillermo del Toro decided not to quote the book at the beginning of the first Hellboy movie because he felt it had been overused. With the ubiquity of the Internet, it is unsurprising that the book has become part of online folklore. Rumors and tales of the book can circulate more quickly now. Believers in the book’s reality quote as gospel articles such as Colin Low’s “Necronomicon Anti-FAQ” and Ryan Parker’s “Necronomicon Info Source,” both of which were early Internet jokes. One of my friends, while in a feverish state one afternoon, wrote his own Necronomicon, entitling it the Grimoirium Imperium. This has turned up on numerous sites thereafter, with at least one person insisting it was the magical equivalent of a nuclear weapon. Numerous permutations of the various classic Necronomicons— de Camp, Hay, and Simon— continue to appear online. Some of these are straight reprints, while others include warnings and clarifications of those who have edited, worked with, or otherwise touched these books. Simon has even publicly complained about the theft of his work— an odd attitude for a man who supposedly received his book from thieves! To further muddy the waters is the appearance, over the last few years, of live action role-playing games, or LARPs, in which people play out genre adventures using props and costumes. Among these creations have been prop Necronomicons, the product of desktop publishing software and long hours of painstaking labor by their creators. These are often quite impressive, including leather bindings, archaic fonts, and texts taken from Lovecraft, published Necronomicons, and the authors’ own imaginations. In this manner, Necronomicon rumors and texts continue to appear, recombine, and reappear, like a mystical kaleidoscope. One wonders whether Lovecraft would have laughed or stared in horror at the whole affair. Nonetheless, some of you might insist on looking for the Necronomicon yourself. I encourage you to do so, and not merely to take my word for it. After all, given the dark rumors that surround me, I cannot be trusted on such matters. All such seekers should beware, lest the revelations you encounter drive you mad! Dan Harms is the author of The Necronomicon Files .He is a librarian and writer living in upstate New York. He has written two books, The Cthulhu Mythos Encyclopedia( Elder Signs Press) and The Necronomicon Files with John Wisdom Gonce (Weiser). You can read more of his writing and contact him via his blog, “Papers Falling from an Attic Window,” at http:// danharms.wordpress.com. The post The Necronomicon How Lovecraft’s Creation Grew a Tale appeared first on Paranoia Magazine.